Metal-to-metal sealing is accomplished by the “line contact” between a spherical surface and conical surface. 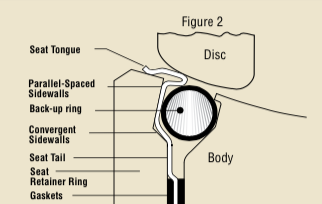 Figure 1 illustrates a typical globe control valve seat and plug. 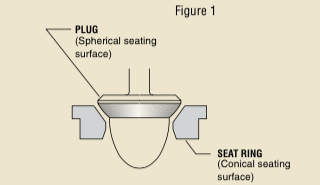 The plug seating surface is the segment of a sphere; when engaged against the seat ring, a line contact seal is achieved. In a metal seat design, it is necessary to apply enough force per linear inch to maintain a tight metal-to-metal contact between the seal- ing members; however, high linear thrust can cause a collapse of the seating members (“bearing failure”). 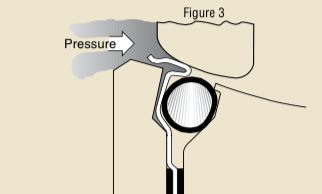 In Figure 2, the Flowseal disc and seat are engaged, and the process fluid is under low pressure. The spherical edge of the disc, with a larger diameter than the conical seat tongue, imparts a thrust of approximately 600 pounds per linear inch against the seat. The mechanical properties and shape of the Inconel® seat allow it to both flex and maintain a constant thrust against the disc. This controlled loading prevents the occurrence of bearing failure and reduces the leakage and wear between the components. As line pressure increases, the process fluid enters the sidewall area and applies a load against the parallel-spaced sidewall and convergent sidewall of the metal seat. 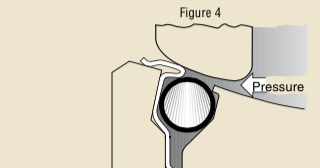 The seat moves towards the downstream sidewall while being supported axially by the support ring, as shown in Figure 3. The cavity shape confines the seat movement and directs the movement radially inward towards the disc; the higher the line pressure, the tighter the line contact between the disc and seat. The Inconel® seat, shaped by a special hydroforming process, is able to flex under these loads and return to its original shape after removal of the loads. 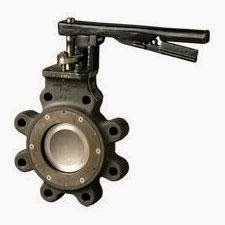 This dynamic seal, patented by Flowseal, is totally unique among high performance butterfly valves. The Flowseal valve is bi-directional (in some instances, modifications may be required to operate this arrangement for dead end service). The cavity and seat sidewalls are symmetrically designed to permit, confine, and direct movement of the seat to the disc to dynamically seal with line pressure in the seat downstream direction, as in Figure 4. Recommended installation direction is “SUS” (seat upstream), as in Figure 3. The stainless steel back-up ring interacts dynamically with the metal seat for axial support in seat sealing. Additionally, this ring effectively restricts corrosion and particulate build-up in the cavity.